Do product managers have super powers? Probably not, but there are some product managers who seem to be more successful than others. These “super” product managers seem to be able to make things happen almost effortlessly. What’s their secret? BRAINSTORMING: HOW TO DO IT THE RIGHT WAY! HOW QUICKLY DO PRODUCT MANAGERS NEED TO REACT TO BAD PRESS ABOUT THEIR PRODUCT? More often than not, when you take a look at how super product managers go about doing their job, you’ll quickly discover that they are great communicators. This means that they are able to express their thoughts clearly and get others to quickly understand what they need to have done. The rest of us can learn a lot from these super product managers. What we need to learn is how to improve our communication skills. Oh sure, we already have communication skills; however, we could always use a little help in making them better. One of the most important places that a product manager needs to be a good communicator is in business meetings. So much of what affects our product happens in meetings that knowing how to make the most of face-to-face and online meetings is a key part of the product management job. We also have to know how to make sure that that actions that come out of meetings actually get followed up on. The job of a product manager revolves around communicating with large numbers of different people. This means that we need to know when we should use the phone, email, or face-to-face contact in order to get what we need to have done, done. 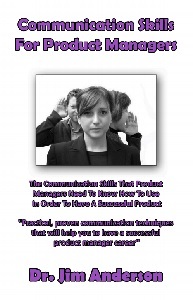 Contained in this book are the tips and tricks that you are going to need in order to become a more effect communicator. As you read each chapter, take a moment to think about how you can start to use the information in your job immediately. I think that you are going to be both surprised and pleased with just how much this information is going to help you to clearly communicate what you need others to do for you! Over the last 25 years, Dr. Anderson has transformed failing products worldwide. Dr. Anderson will turn these money pits into money makers. Welcome to the premier blog for learning how to develop, launch, and manage wildly successful products.